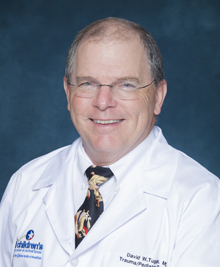 Dr. Tuggle was Vice Chair of Surgery and Chief of Pediatric Surgery at the OU Medical Center until 2013. He and his wife moved to Austin to be near their son, daughter-in-law and grandchildren. His current interests are trauma and acute care surgery in children. I thought I would be a professional musician, but I changed my mind one month before college started. One of the three best decisions I have made. Training as an adult surgeon allowed me to have contact with children, and I fell in love with pediatric surgery (another really good decision). My best decision was proposing to my wife. I love all aspects of pediatric surgery, but I fell into my clinical focus by accident. When I started pediatric surgery, few pediatric surgeons were really was interested in taking care of injured children, so I made it my interest. It gave me a great opportunity to do research and teach young doctors. Five of the 20 pediatric surgeons I trained now are trauma directors at their own hospitals.